The Greatest Circus Show on Earth is introduced as the biggest show in the world, with over 100 acrobats, 200 dancing women and a menagerie of wild animals... but when the artists enter the space there's only two of them: one ringmistress and one performer. It transpires that everybody else in the cast is dead and the one performer will play all of the acts (posing as different artists from all over the world) with a little help from the audience. The piece has five acts. 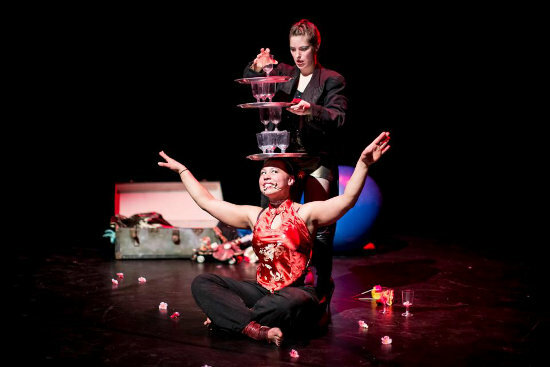 Act 1 is a unicycle and juggling performance, full of smiles and cheesy gestures. Act 2 is a horse riding act in which a 'horsey' member of the audience is chosen to be ridden by the performer. Act 3 is a lion taming act in which all audience members compete in groups for the loudest roar. A group is chosen and instructed on lion etiquette. The best 'lion' is brought onstage to perform the 'head in mouth trick' with the ringmistress. Act 4 is a large-scale acrobatic act in which the audience are trained as 'catchers' and the flyers are dolls. Act 5 is the finale, an escape act. During the act the performer is pushed too far and dies inside a box on stage. The show finishes with a poem depicting how the 100 acrobats and 200 dancing women all died. Tour dates: Summer festivals and longer runs during the autumn. 1 large suitcase with all the props inside. Props include: Party poppers for all the audience; 5 dolls; various costumes for on-stage costume changes; plastic glasses; unicycle/walking globe/juggling balls.